[Jesus said,] "Anyone who doesn't love me will not obey me. And remember, my words are not my own. What I am telling you is from the Father who sent me. I am telling you these things now while I am still with you. But when the Father sends the Advocate as my representative — that is, the Holy Spirit — he will teach you everything and will remind you of everything I have told you." Jesus' words are God's words. When we obey Jesus, we obey the Father. When we disobey Jesus, we disobey the Father. So how will we know what Jesus wants us to do? 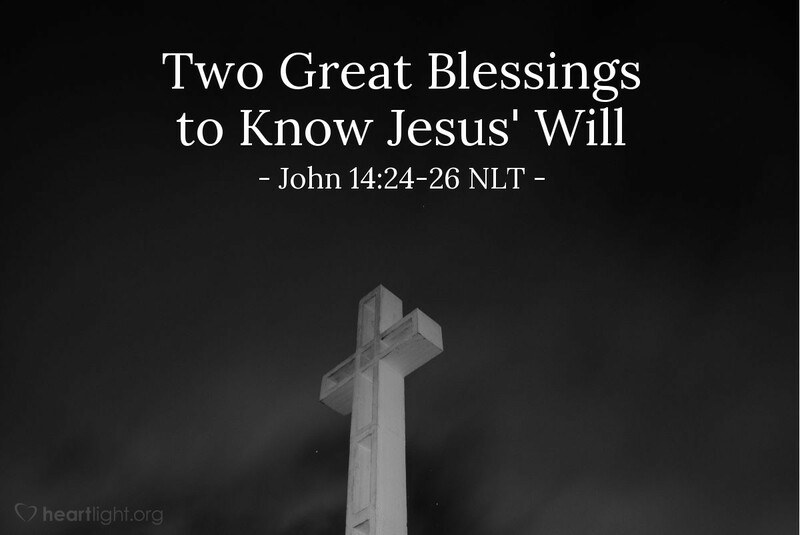 Two great blessings: One blessing is Scripture, especially the Gospels (Matthew, Mark, Luke, and John) that tell us about Jesus' life and words. The other blessing is the Holy Spirit, which helps us understand Jesus' words, reminds us of Jesus' words when we are trying to live for him, and leads us to become more like Christ. Father, please bless me as I seek to obey Jesus and live according to his words for my life. Thank you for the Holy Spirit who is at work to bring those words to life in me. Forgive me, dear Father, when I have not sought to know more about Jesus in Scripture or when I have resisted the work of the Spirit to transform me to be more like my Savior. In Jesus' name, I pray. Amen.